Jessica Upchurch is the first person I saw and spoke with when I walked into KnuckleUp Fitness’ Midtown gym. Well, spoke with and then saw, since she gave me directions on how to get there. So, I suppose she’s partially to blame…to thank for my finding Muay Thai. She’s an inspiration, truthfully—supportive of and an integral part of our team. Beyond her duties as a KUF employee, she showed a genuine interest in my getting into Muay Thai, sharing her experiences with the art, providing advice that helped me—all of us, I’d wager—develop. She wasn’t able to compete in our recent competition, but she was there, as vocal as anybody and louder than most! And if every woman fought like Jessica fights, “fight like a girl” would be a universal compliment. “I’ve always participated in male-dominated sports. When I was four years old, my dad signed me up for t-ball, and he was my coach for almost twelve years. Football and soccer were always fun for me because of the contact involved, so I played on school and intramural teams as much as I could. My first exposure to martial arts was around 11 years old, when I took Judo classes with some fellow baseball teammates. I fell in love with it. I had always played team sports, but here was my first chance to learn a skill that I would be using in a one-on-one situation. Unfortunately, my parents got a divorce; and my free time was filled with only what my parents had time for, which did not include martial arts. Rizzo, giver of leg welts. Check the video below. Ouch! I began watching UFC back in college, and could not get enough of it. I don’t know if it was my previous exposure to Judo when I was younger, or if I just enjoyed watching people get destroyed on the Ultimate Knockouts DVD. I had never been interested in watching boxing, but this was different. Each fighter had a whole arsenal of moves at his disposal. Some were good on the ground, such as Hoyce Gracie. Some were powerhouses, such as Tank Abbott. 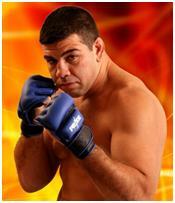 But I think my favorite fighter from the 90’s-era UFC was Pedro Rizzo. One look at his legs, and you knew that you were in trouble. Rizzo has trained in Muay Thai all over the world. At the time, I didn’t know what art was Pedro’s specialty, but I knew that I was jealous. He would literally chop down his opponent with each kick. Every time, chop! His opponent would collect huge red welts on their legs, and eventually begin to wobble and compensate for the pain that Rizzo was inflicting on them. It was beautiful, watching him strike. I still aspire to be as devastating as Pedro Rizzo when I fight. Until last year, I had always admired Martial Arts from afar. I had followed UFC as it began to grow in popularity, and I attended local MMA fights and asked fighters about their experiences whenever I got a chance. When I lived with my soon-to-be brother-in-law Stephen, I got a glimpse into the daily life of someone who was training to be a Muay Thai fighter. Every night, Stephen would drag himself to the couch after getting home from a grueling practice. Bruised, but not beaten, he’d tell us about what fresh pain he had endured that day. I wondered what type of person would put himself through this over and over, but I came to respect the hard work and dedication that I saw. Again, for my lack of blogging presence, I offer my humble apologies. Busy? Yes, but that’s not so much my excuse as is my broken wrist. How? Two words: Muay Thai. Thai Boxing, in another two words. In past posts, I’ve shared some of my experiences in training as part of Team Upchurch, representing Midtown in the KnuckleUp Fitness Muay Thai Sparring League. The two-month-long session culminated in a competition back on July 11. We, as a team, did well. I, as an individual, didn’t do so well as I snapped my forearm in the first round. Check the video here, if interested. But don’t worry, it’s not too gross, unless you press pause at the right moment. As you’ll see, I basically fell and tried to stop the fall with my arm. Reactionary move. Couldn’t help it; Pavlov would be proud. I landed some strikes and so did my opponent. All in all, I’m OK with my bout. But I was amazed how…different it is being in the ring, engaged with a person who can, given the chance, hurt me. Given, I don’t recall anything that he landed really hurting at all (nor do I think my strikes did much damage either). Regardless, he and his coach have my respect. Perhaps it was the adrenaline, perhaps he wasn’t that strong a striker. Snapped Radius? Not so good. Reflecting on the competition, well…there’s a lot to share. Starting with the next post (aiming for Wed. or Thu. this week), I’ll do so over the course of a few days, perhaps weeks. We’ll start with our team’s answers to a question our coach put to us on Monday: Why do you want to be a Thai Boxer? It’s always good to ask ourselves why we do what we do.